This lighthouse features our revolving lighthouse fixture, fixture mounting kit, a plastic door and six plastic windows. Rotating beacon gives just the right amount of light for a realistic lighthouse effect, but isn’t distracting. Make from one sheet of 1/2" plywood, one sheet of 3/4" plywood, and common lumber sizes. All patterns drawn FULL SIZE. (This plan replaces our #W2026 Lighthouse Plan with the stationary 3-light wiring harness.) Order the #5022 Revolving Lighthouse hardware separately or see #5023 Revolving Lighthouse Special separately below. The #5022 Lighthouse Hardware package includes our revolving lighthouse beacon with fixture mounting kit, six clear acrylic plates, all necessary dowels, one plastic door, six plastic windows, brass escutcheon pins, and a 3" decorative wood ball for the top of the project. Project plan, optional copper lighthouse roof kit and optional copper railing tubes, remaining wood and paint not included. 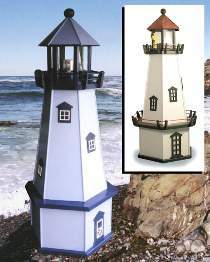 The #5023 Revolving Beacon Lighthouse Special includes #W2978 Revolving Beacon Lighthouse Plan and #5022 Lighthouse Hardware.